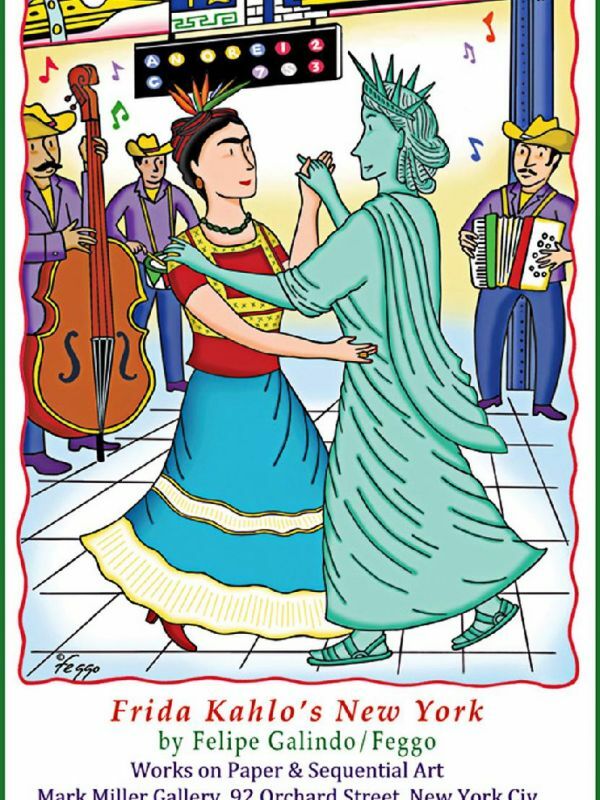 Award-winning, Mexican-American cartoonist and illustrator Felipe Galindo/Feggo presents “Frida Kahlo’s New York” an exhibition at The Mark Miller Gallery from May 7 through June 7" (Lower East Side, 92 Orchard St, New York). The exhibition features works on paper and sequential artworks, as well as preparatory drawings and storyboards for the animation in progress of the same title. "It's an homage to Frida Kahlo," Galindo told Latin Post in an exclusive interview. "Everything I'm doing is very whimsical. I am imagining what she would be doing here in New York or if something in New York had influenced her work, I am just picking that up in a humorous way." "She will be visiting many places in New York. She will be visiting the Statue of Liberty, looking at advertising in the city and self-portraits. I am using elements from her work. ... It will be fun, you will see!" While Kahlo has visited the Big Apple five times, Galindo wanted to focus on her visit in the 1930s and 1940s. "At the time, she was more known for being Diego Rivera's wife. They were well-received and she was the talk of the town," Galindo pointed out. "They had a lot of displays based on the way that she dressed." "It wasn't until I moved to New York in the 1980's that her work became more noticeable again. Basically, she was being discovered," he explained. " I noticed that she had a lot of strength in her work and in her persona (that was celebrated by) feminists to art lovers and even in arts education. For example, for me to see a third grader that knows Frida Kahlo, it's very rewarding in the sense that Mexican art has really been appreciated in all of its forms," said Galindo, who is also a third grade art teacher. "I am also a little embarrassed that in my generation in Mexico, that we were not paying attention to her. Now, I am making up for it," he laughed. Coincidentally, Galindo lived in Coyoacán, the same borough in Mexico City where Kahlo lived. He also worked right across from her home, which is famously known as "La Casa Azul." "It was made into a museum, but nobody was ever there," he said. "There was a point in the '70s ... the entrance was free, but no one was there at the time. There were a few students who liked her and liked the Mexican movement. ... It was a struggle between the old school and the new school." "Frida Kahlo's New York" also salutes the much anticipated exhibition "Frida Kahlo, Art, Garden Life" opening in mid-May at the New York Botanical Garden in the Bronx. Check out here the full interview of Felipe Galindo with Latin Post. See also the video below of an interesting speech by Felipe Galindo.